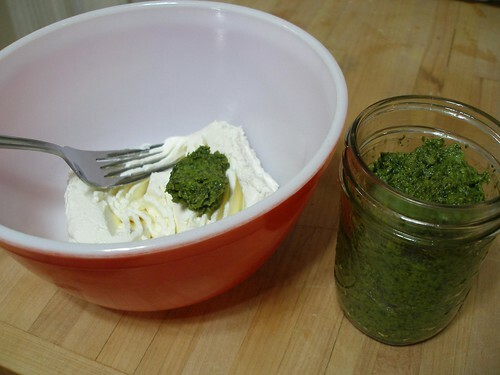 One day at the farmer's market, I bought a batch of cilantro pesto, which I loved. I loved it so much, in fact, that I've kept it in the freezer and used it by the spoonful in all kinds of things from rice to scrambled eggs to mashed potatoes. And it's really fantastic on roasted vegetables and to add extra flavor to soups. 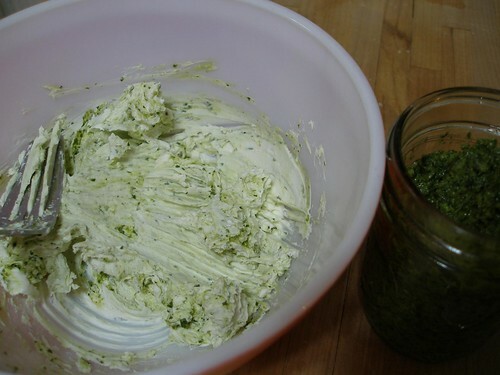 The most recent use that I've found for it though, is to spicy up cream cheese for jalapeno and prosciutto wraps. The problem was that the pesto was really expensive to buy and I had a sneaking suspicion that it would be fairly cheap to make. I had looked and looked, but could never find a recipe to make it for myself. This really irked me, especially considering how often I have left over cilantro to make it with. So pesto making was at a standstill. And bunches of leftover cilantro often died sad deaths in my fridge. Until, that is, I ran across Pestos, Tapenades, and Spreads by Stacey Printz. I have combined two of her recipes and then done a bit of my own tweaking to come up with the following nut-free recipe. If you like cilantro, you'll love this. If you hate cilantro (as most of my family does), it's so good that you may still like it. Joey proclaimed this ringing endorsement... "I don't hate it." Which is amazing coming from the kid who gags when she walks into the kitchen after I've been cutting cilantro. -Mix everything but the panko and oil in a food processor or blender. Blend until it's a coarse mixture, scraping down the bowl as necessary. -Add 1/3 cup of the panko and blend well. -With machine running, pour oil in through hole in top of machine. Keep mixing until it's well combined. -Let sit for 5 minutes or so to allow the panko to absorb some of the liquid. -I suggest that you freeze leftover pesto in an ice cube tray and then store the little cubes in a mason jar in the freezer, just like I do with leftover chipotles. Then you can pull them out, one at a time to use as you see fit. So yah, there are a ton of things that you can do with this. What follows is the recipe for jalapeno wraps that I made up for New Year's. They would be great for a Super Bowl Party. I'll probably only bother making these when I'm going to a party because Jeff likes neither jalapenos nor cilantro. Poor guy. 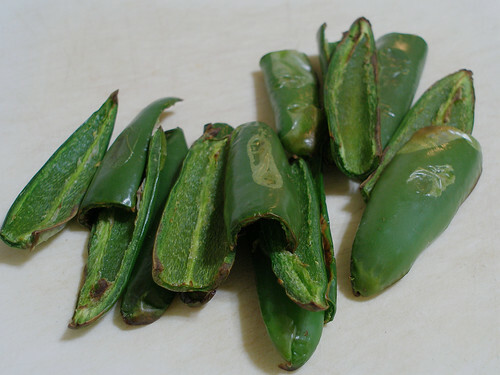 -For each jalapeno, cut off the stem, cut in half length wise and scrape out the seeds and ribs. Avoid touching your eyes or any other sensitive bits for many hours. Trust me. -Place on a broiler pan, skin side up and put about 5 inches from broiler, until flesh is softened somewhat and skin is slightly charred. (I do this to get rid of that raw jalapeno taste and crunch, but this step is optional if you don't mind it.) They'll look a bit like this. 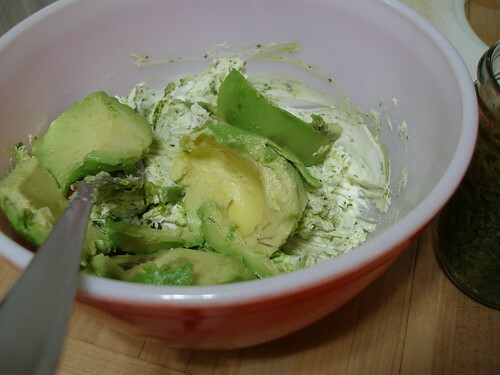 -In a bowl, mix together the cream cheese, cilantro pesto and avocado till it's fairly smooth. Sorry, you'll just have to imagine what it looks like when it's fairly smooth. I didn't get a picture of that. 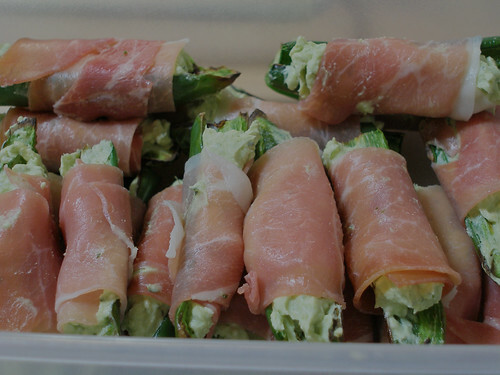 -Cut each sheet of prosciutto in half lengthwise and roll it up around the jalapeno. If you want to make more of these, but don't want to buy another pack of prosciutto, you can cut it in thirds the other direction and use that size to roll around them. Personally, I really like prosciutto, so I used bigger pieces. You'll have to follow your heart on that one. I am not here to tell you how much prosciutto to use. In fact, I made a second batch of these completely devoid of prosciutto for the vegetarians in the group. They were pretty awesome as well. This has nothing to do with this delicious-sounding dish that I'll have to try one day or that you'll make for David next time he's in Colorado, but...speaking of spanish, I taught Conner to say 'muy loco' the other day. Ok, so that doesn't sound so funny as I write it, but it is when you hear him say 'Mom, mawmaw is muy loco!". I love cilantro, and like you, I always have a ton left over because no one in my house eats it but me. I don't care for cheese, so I wonder if I can tweak the recipe to use nuts instead? I wonder if pecans and cilantro will work together? Thanks for the recipe! Deanna, the original recipe called for 1/4 cup of pine nuts instead of the bread crumbs. I'm not sure the Parmesan does much to hold it together, so I'd just try it without it. And I bet pecans would work fine. (as I wipe the drool off my keyboard) This looks awesome! Cilantro pesto? That's brilliant! As a total aside, do you keep an archive of the quotes from your header? I have a mini-obsession with good quotes, and you've had some great ones in the past! Though I do love the current quote, too. Owl Momma, I'm that way with quotes too. That's why I started pairing some of them with pictures for my Sunday Happiness category. For years I've collected quotes in an Excel file. When I move to the new Wordpress site (hopefully in another month or so, I'm getting closer and closer), I'll be making several stand-alone archive pages (Banners, Quotes and Inspiration From Elsewhere), just to make a permanent record of all the stuff that I change somewhat regularly. yummy! I'll be linking to this on the new @foodwhirl.com twitter!